You don't have to go out to your favorite Italian Restaurant to enjoy restaurant style soup at home! 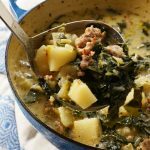 Olive Garden Zuppa Toscana Soup is a quick and easy meal to make. So savory and delicious!